In April, Chicago police voted in a fiery new union president, Kevin Graham, who has vowed to fight the attacks of the “anti-police media.” Graham wasted no time in making his agenda clear. “We look forward to immediately preparing for the upcoming contract negotiations, fighting the anti-police movement in the city, and obtaining fair due process and discipline for our members,” he said in a statement following his victory. The union contract between the city of Chicago and the 8,000-member Fraternal Order of Police (FOP) expires on June 30. Previous contract negotiations have taken place out of the public eye, but this year, a high-profile fight is brewing. A February report from the Coalition for Police Contract Accountability (CPCA) observes that the city’s contract, as well as a separate agreement with the sergeants’ union, “make it too hard to identify police misconduct, and too easy for police officers to lie about and hide misconduct.” The coalition, which includes the ACLU of Illinois, Black Youth Project 100 (BYP100) and the Worker’s Center for Racial Justice, has identified 14 contract provisions it says impede investigations. One such provision allows police officers to wait 24 hours to give a statement after shooting someone. Another prohibits anonymous complaints against officers. “Now’s the time to put pressure on our mayor, to put pressure on our aldermen to do the right thing,” she said. 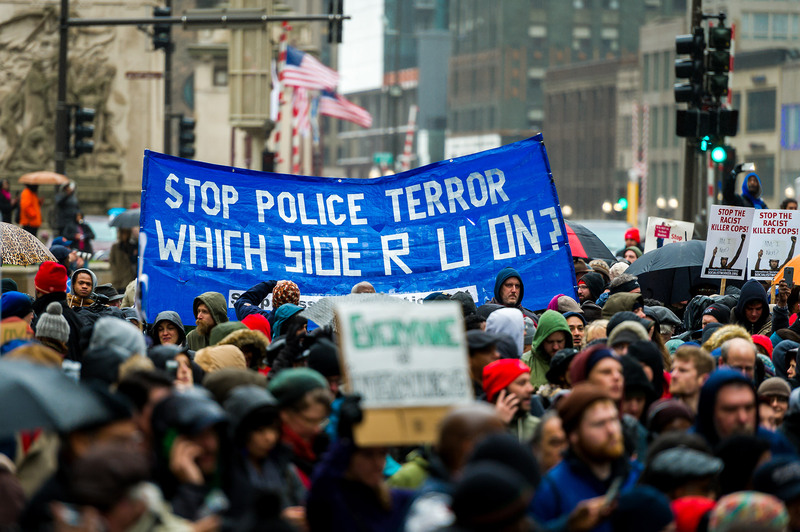 Activists aren’t alone in zeroing in on police union contracts as a roadblock to reform. A January Reuters investigation examined contracts in 82 cities and found a pattern of protections that create hurdles for citizens in reporting police abuse. Most contracts require destruction of police disciplinary records after a certain period. Nearly half allow officers to view the evidence against them before being questioned about alleged misconduct. Chicago’s FOP contract contains both of these provisions. Prior to Donald Trump’s election, it was assumed that if the DOJ found a pattern of unlawful policing in Chicago, it would impose reforms via a court-monitored agreement. But that’s become unlikely, as both Trump and Attorney General Jeff Sessions have pledged to scale back federal oversight of local law enforcement. One June 14, six community groups, including Black Lives Matter Chicago, filed a federal lawsuit hoping to force the city to submit to court oversight of its reform process. Attorneys who filed the suit say that Chicago could do this by negotiating a consent degree with the community organizations, rather than the federal government. In the meantime, local reformers are looking to exert leverage during the city’s upcoming negotiations with the FOP. Activists have allies on the City Council, where more than a dozen of the 50 aldermen have signed on to a resolution calling on Mayor Emanuel to endorse the CPCA’s 14 recommended reforms to the FOP contract. In April, Alderman and Black Caucus Chairman Roderick Sawyer said that his 18-member group would vote down any contract that fails to include these changes. One provision in particular has emerged as a likely sticking point in the upcoming negotiations. 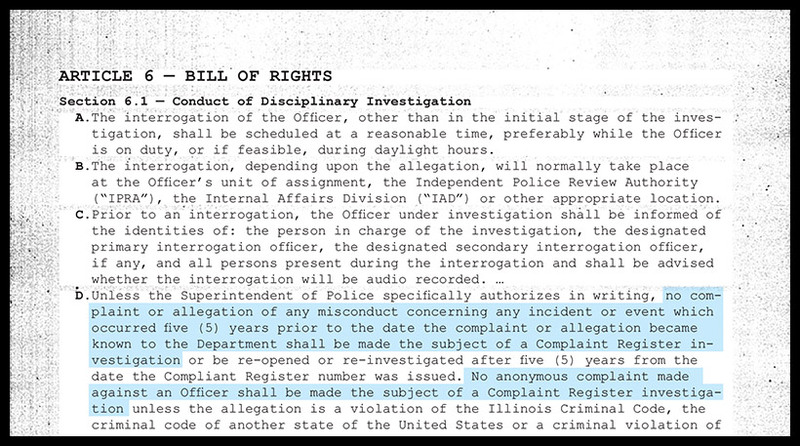 Of the U.S. cities with the five largest police forces, only Chicago restricts investigation of anonymous complaints. In fact, the FOP contract requires not just a name but a sworn affidavit. Many misconduct complaints begin with a letter or phone call; an investigator must then follow up with the complainant. But if the individual cannot be reached again, or does not want to provide a sworn statement, the investigation typically ends there: Accused officers are not even questioned. Another contract provision allows investigators to proceed without an affidavit in certain cases, but they have done so just 17 times in the last five years, out of tens of thousands of complaints, according to the DOJ report. Advocates, however, say civilians reporting police misconduct have good reason not to want to be identified, let alone sign an affidavit. For one, doing so often requires an in-person meeting with an investigator, which can be intimidating and complicated to arrange. Beyond logistical challenges, complainants may also fear reprisal from police. Contract rules require investigators to give the name of the complainant to the accused officer before questioning. And in cases of domestic abuse or sexual assault by police, victims may be ashamed or have a personal relationship with the offender. The FOP argues that affidavits are needed to prevent a deluge of false complaints. The low number of sustained complaints—those that investigators deem to be supported by enough evidence to justify discipline—could suggest that many misconduct allegations are already baseless. Between 2010 and 2014, investigators sustained just 11 percent of the 7,300 complaints received with signed affidavits. 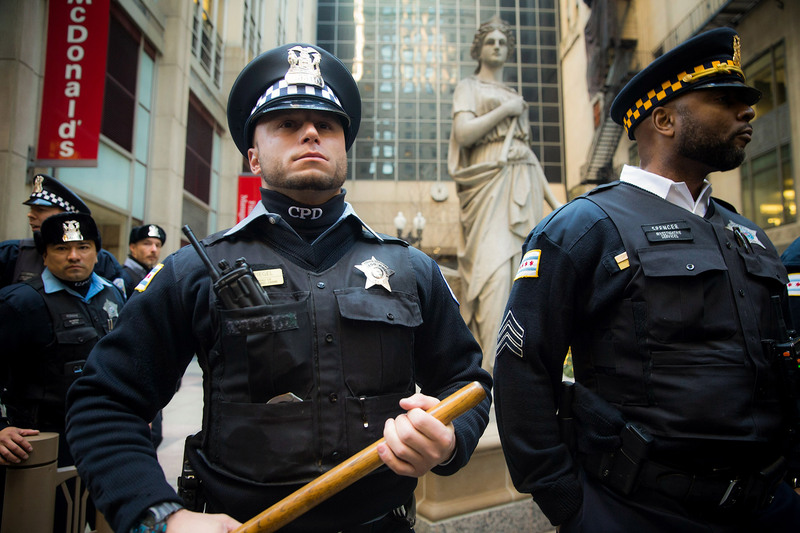 A November 2016 study by Kyle Rozema and Max Schanzenbach of Northwestern University, however, found that the volume of civilian complaints against a Chicago police officer correlates with whether the officer will eventually be sued for misconduct, as well as the probability and size of a civil settlement. Unsworn civilian complaints were just as predictive as those with affidavits. “Civilian allegations, if properly managed, could play an important role in reducing police officer misconduct and costly civil liabilities,” the study concludes. Between 2004 and 2014, the city spent more than $500 million in police misconduct lawsuits, according to an analysis by the Better Government Association. Meanwhile, about 40 percent of misconduct complaints are closed each year because they lack affidavits, according to the DOJ report. In These Times’ review suggests these unexamined complaints could have acted as warning signs. Over the same 10-year period, the 50 most complained-about Chicago officers averaged 17 no-affidavit complaints each. Drawing on civilian complaint data released by the city in October 2016, as well as investigative files obtained through Freedom of Information Act requests, In These Times identified at least a dozen cases in which police officers sued for alleged misconduct—including false arrests, warrantless searches and excessive use of force against civilians—had previously racked up multiple complaints describing similar types of behavior. But because these complaints lacked affidavits, they were never investigated. Sean Campbell, a white police officer working in the city’s Chicago Lawn district, has been named in four separate misdconduct lawsuits that collectively cost the city of Chicago $96,000. In one 2015 case, Campbell and fellow officer Steven Sautkus were sued by Lashaun Duprey, a 20-year-old African-American man who was a passenger in a car stopped on the Southwest Side of Chicago. The officers allegedly asked Duprey, “What are you monkeys doing around here?” before pulling him out of the car, punching him in the face and arresting him. Duprey’s family was unable to post bail, so he remained in jail for 10 days before the charges of resisting arrest and disobeying a police officer were dismissed. The city settled with Duprey for $30,000. Another 2015 case named not only Sautkus and Campbell but Campbell’s wife, Emily, and brother, Michael, who are also Chicago police officers. Jonathan Guzman, an 18-year-old Latino man, accused the four officers of repeated harassment. Emily Campbell allegedly threatened Guzman with arrest in 2013 for passing out flyers for his grandfather’s landscaping business; Campbell’s relative owned a competing business. In another incident, Sautkus and Sean Campbell allegedly pulled Guzman over, planted marijuana on him, impounded his car and stole his iPhone. The case settled for $35,000. Prior to these incidents, 16 complaints against Sean Campbell were closed because they lacked affidavits, including allegations of racial slurs, unnecessary physical contact and illegal arrest. Between 2000 and 2014, Campbell amassed 79 total complaints—among the highest of any CPD officer over that period. According to available data, Campbell has been disciplined just once, for an off-duty DUI. Attempts to reach Campbell for comment through the CPD, FOP and city attorneys were unsuccessful. The case settled for $24,000 in May 2013. All nine officers had previous complaints related to illegal searches that were closed because they lacked affidavits. They have collectively been named in six suits that cost the city $170,000. The DOJ investigation found that, in most such lawsuits, “[the Independent Police Review Authority]’s parallel misconduct investigation was closed for lack of an affidavit,” meaning that officers were never disciplined, or even investigated, for the same incident that sparked lawsuits. In at least one case, CPD apparently missed an opportunity to catch a sexual predator because of a closed misconduct complaint. On Oct. 23, 2013, a 21-year-old woman left her uncle, off-duty police officer Allen Hall, in the car with her 3-year-old daughter. When she returned, she noticed the toddler was now in the front seat and looked upset. Later that day, the child told her mother that Hall had forced her to fondle him. The mother reported Hall to police detectives. A criminal investigation revealed that Hall had abused the mother, as well, when she was a teenager. Hall was arrested and pled guilty to molesting both the mother and her daughter. He was eventually sentenced to four years of probation, evading prison. The CPD put him on administrative duty until he retired in October 2014. These allegations were reported immediately to the Bureau of Internal Affairs, triggering a complaint file. But Hall was never questioned. The complaint was closed in August 2013—because it lacked a signed affidavit. Saffold was an early member of the Afro-American Patrolmen’s League (AAPL), an organization formed in 1968 to organize black officers around issues like discrimination in hiring and promotions. They also attempted to address police misconduct, implementing CPD’s first complaint system. But when Chicago police voted to join the FOP in 1980, the union quickly positioned itself against the racial justice agenda the AAPL was pioneering. Thanks in part to the FOP’s efforts, Illinois police even have their own “bill of rights,” one of 14 such laws nationwide. Passed in 1983, the state law enshrines many of the same protections contained in Chicago’s police union contract, including the affidavit requirement. That doesn’t negate Chicago activists’ campaign to reform the FOP contract: If the city successfully negotiates changes to the agreement, those would trump state law under Chicago’s “home rule” authority, according to Lindsay Miller, a staff attorney at the ACLU of Illinois. Efforts are also underway to abolish the state’s affidavit requirement. In the meantime, DeAngelo Bester says his group is planning demonstrations targeting the mayor, the City Council and the FOP. Organizers have also been holding teach-ins about the police union contract. Because the provisions of the current agreement will stay in effect until a new one is ratified, Bester worries that the union could stall negotiations. Janaé Bonsu, BYP100’s public policy chair, sees the contract fight as just one aspect of her organization’s long-term work to redirect public resources from policing to community-based services. She’s encouraged by the support from local aldermen but knows that activists still face an uphill battle. This story was supported by a grant from the Leonard C. Goodman Institute for Investigative Reporting. 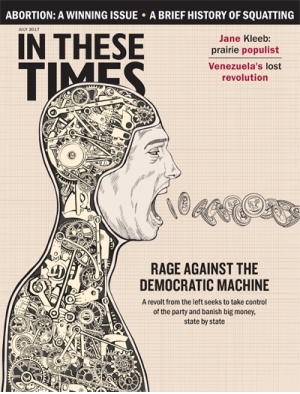 Sarah Cobarrubias, Timna Axel, Jeremy Borden, Joseph Bullington and Reuben Unrau also contributed reporting.